The Legacy Mark CemWeb© Customer Support Center is an exclusive internet-based system for our customers to access resources to maintain their software investment and get help efficiently and on their own schedule. CemWeb© is designed to bring the tools, resources and functionality that our customers need to run their cemeteries and manage their data. It also provides services that can be customized to help our customers serve their customers through the internet. 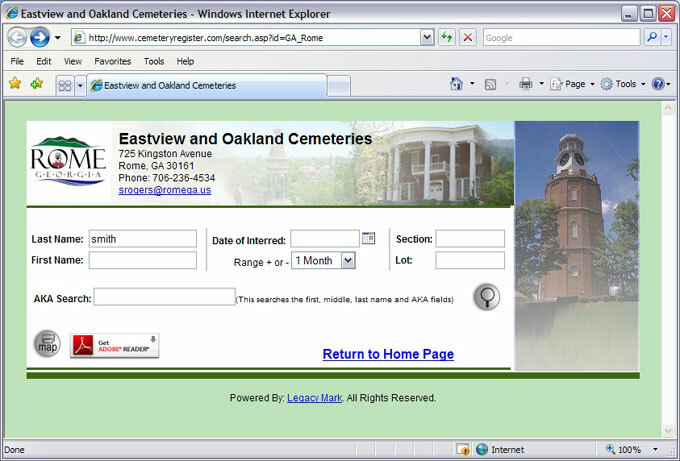 CemWeb© is the internet extension of your Cemetery Office Management system. The Exclusive CemWeb© Data Vault to store supplemental copies of your Legacy Mark data on your server space. This provides an extra level of protection with off-site storage. 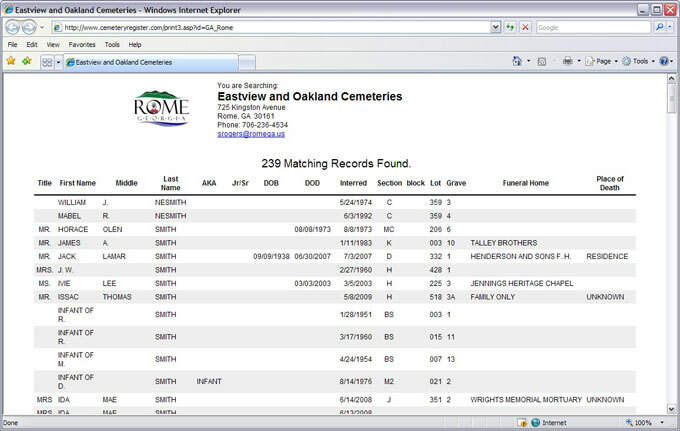 Exclusive Cemetery Data Search to safely post data on-line so your clients can easily search for burials, print reports, view maps, etc… See the samples of our Data Search utility in use below and to the right. Download Center for program updates to your installed Legacy Mark software licenses. Messaging Center to keep in touch with Legacy Mark Technical Support. You can send questions, comments and even attach files to easily forward to Legacy Mark Support. Recent Issues and FAQ’s provide technical details to keep you informed and to answer your questions quickly. Individual Account and server space created for each customer to use. Features for all customers with and without active support agreements.